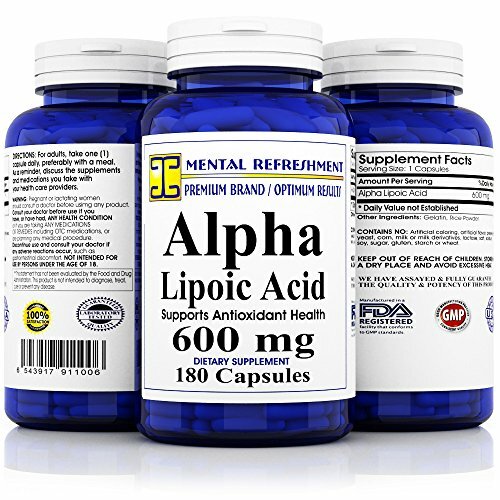 Alpha Lipoic Acid is a naturally occurring compound found in the body. Research has shown it to play a role in energy production, as an antioxidant to protect against damage to the body's cells and by enhancing the body's ability to use insulin. This Dietary supplement provides timed release antioxidant protection. Alpha-lipoic acid is a powerful fat and water-soluble antioxidant. It directly recycles Vitamin C and indirectly recycles Vitamin E, providing additional antioxidant protection. It is also an important component in the glucose metabolism process within cells. Helps maintain healthy blood sugar level when used as part of the diet. Made in USA following strict Good Manufacturing Practices (GMP). If you have any questions about this product by Mental Refreshment Nutrition, contact us by completing and submitting the form below. If you are looking for a specif part number, please include it with your message.